The Local Scope – Page 2 – Simply Living Local in Winchester Virginia. Come Together Right Now, Over Soup! It’s officially the slow-down season. January is when social activity begins to fall off and rightfully so – we all need time to reflect and replenish ourselves. As winter drags on though the cold and darkness can sometimes feel isolating. To cheer yourself back up, round up a few friends and neighbors for a soup night party. Just like big fluffy socks and loose sweaters, there’s something about soup that speaks to coziness and comfort. Soup is generally healthy, inexpensive and fairly easy to make. It’s also easy to expand recipes for more servings. For all of those reasons and more, soup can be a wonderful way to reconnect with those you care about. Keep it potluck style: Call or email a few friends and explain the idea. Ask if they’d like to participate and bring something to the gathering. They could bring salad, good bread, snacks, wine, soup toppings or even more soup. Another fun idea is to ask guests to bring their own soup spoon and bowl. Make it in advance: The last thing you want to have is soup day stress. Plan ahead and make your soup a few days in advance and reheat it the night of the party. This will make things much easier for you and soup always tastes better a couple of days after it was made. Offer a couple of options: Whether it’s you whose making all of the soup or a couple different friends, be sure to consider your guests eating habits and offer at least two different soups for the evening. Encourage Comfort: You could have some cozy slippers or fluffy socks on hand for guests as they enter but an easier way might be to encourage them to bring them along and to dress comfortably. Stretch-wear permitted. A soup night party isn’t for glamour and dazzle. A soup night party is about communion. It’s about catching up and reconnecting with friends. Keep it fun: To keep the conversation flowing you might try any number of conversation games. You could also just make your own. Check out this website for tons of great questions. Print some off, clip them, and place in a basket. Pass the basket around the room having each guest select one and answer. Another idea might be to ask each guest to bring a book and have a book exchange. Have them all speak about the book they brought and why they enjoyed it. When hosting a soup night party the most important thing to remember is to keep things stress free and simple. A snug night in with delicious and healthy food, great friends and fun conversation is guaranteed to refresh you and your guests with the resilience to continue on into the remaining days of winter. This recipe for a hearty chicken and brown rice soup is simple to make and always a hit! Add butter and oil to a large dutch oven and heat over medium. Season chicken thighs with salt and pepper then add to pot and brown on both sides. Remove chicken and set aside. Add the onion, celery and carrots to the pot and cook till onion is translucent and vegetables are slightly cooked. Add in the rice and stir to combine. Add in the garlic and stir to combine. Place chicken and juices back in the pot. Add in the bay leaves, thyme and stock. Bring to a boil, then simmer until chicken is cooked through…about 35-40 minutes. Remove chicken and set aside to cool and continue cooking the soup. Once chicken is cool enough to touch, chop meat and add back into the pot. Discard skin and bones or save for stock. Continue cooking soup until the rice is tender. The longer you cook it, the more the rice will absorb the liquid so just add in additional stock as desired. Remove bay leaves and taste for additional seasoning prior to serving. This amount will serve 6. Hideaway Café offers almond and soy milk for beverages, gluten free bread and bagels available for sandwiches, and gluten free and occasional vegan cookies. The menu items are made to order, so almost anything can be made to meet your needs. George’s Food & Spirits offers food items that are shellfish, gluten, or dairy free. They are willing and prepared to fit most dietary needs. Thai Winchester Restaurant offers substitute sauces and can eliminate eggs to make many meal items vegan. Almost all dishes have a vegetarian option and most dishes are gluten free. The ingredients are clearly mentioned on the menu to make it easier for customers to choose menu items that fit their needs. Fresco Kitchen offers vegan, gluten free, and vegetarian options throughout their menu. They also offer gluten free desserts and rotating weekly meals that are often allergen friendly. Bright Box Theater offers a variety of appetizers and desserts that are gluten free or vegetarian, and a rotating weekly soup that is often allergen friendly. Many menu items are or have the option to be gluten free. Other allergies can be catered to as well. Brubakers Restaurant offers gluten free soups and desserts. Most of their menu items have gluten free options. They also have gluten free beer available. They have a few vegetarian options as well. The restaurant does not serve any items with peanuts or peanut products. Violino Restorante Italiano offers 4 -5 appetizer options that can be made gluten free, and have gluten free and vegetarian soups as well. The menu items will state if the item can be changed to fit your dietary need. They also do not use any soy or peanut products in the restaurant. 147 North Restaurant and Nightclub offers a veggie burger and salads for vegetarians. They can also make a few gluten free accommodations, such as baking potato skins instead of putting them in the fryer. Just ask them ahead of time and they will do what they can to accommodate your needs. El Centro Classic Mexican Food and Drink offers 12 gluten free items in their own section on back of main menu. They have vegetarian and vegan options throughout the menu. They also have gluten free beer. Let your server know and they can modify other items as well. They do not use any peanut oil. The mole sauce is the only item that contains peanuts. They use soybean oil to cook their foods. Roma Old Town Wood Fired Pizzeria offers a gluten free pizza crust, and vegetarian menu and pizza options. They can eliminate the breading on certain items to make them gluten free. They use soy oil, with no peanut oil. They also offer ciders and mead for gluten free options. Awabi Sushi Bar offers gluten free sushi options, gluten free soy sauce, and are willing to customize certain menu items to fit your needs. They also do not use peanuts or peanut products in their restaurant. This is just a start…more restaurants to come in future articles!!!!!! Once cooked, puree with some Parmesan and Thyme. Turn it into a delicious pasta sauce. What’s your favorite way to eat butternut squash? Science validates what our grandmothers knew. Rich homemade broths help cure colds. Bone Broth is a highly nutritious stock made by simmering animal bones and connective tissue. Using acid, such as vinegar or lemon juice, breaks down the collagen and connective tissue. This leaves you with a tasty, nutritious liquid commonly used in soups and sauces. Peasant societies still make broth. It is a necessity in cultures that do not use milk because only stock made from bones and dairy products provides calcium in a form that the body can easily assimilate. Broth a necessity when meat is a luxury item, because gelatin in properly made broth helps the body use protein in an efficient way. Glycine in bone broth can boost calmness and mental clarity and is good for anxiety. Real bone broths need time to develop flavor. The longer you simmer bones, the more nutrients that leach out and thus, the more flavor. Second, a good broth will contain good quality bones. The better the diet and treatment of animals, the healthier they are (duh!) and the more nutrients that leach out. And finally, a good bone broth uses not just bones but a variety of other collagen-rich animal parts that impart valuable nutrients such as gelatin which, when a broth cools, gives it a jello-like consistency. Gelatin is rich in amino acids that play important roles in digestion, joint health, skin health, detoxification and even sleep and mental health. Add all of the ingredients to a 6 quart (or larger) slow cooker. * Cook on low for 12 hours (or more). While still hot, use tongs or slotted spoon to remove large pieces from broth. Then pour through a wire mesh strainer to remove the remaining solid bits. METHOD 1: Pour broth into a large bowl or container, cover, and refrigerate overnight or until completely chilled. Scrape the hardened fat from the top and discard. METHOD 2: While broth is still warm, pour it into a grease separator (available on Amazon and at cooking stores), that allows you to pour the fat-free broth from the bottom. FREEZE IT. Broth can be refrigerated for 4 to 5 days. For extended storage, it should be frozen. It’s convenient to freeze it in 1 or 2 cup portions for easy use in recipes. USES: This broth can be used in any soups, gravies, or any recipes calling for chicken broth. It also can be drunk as is for a healthy supplement to your diet. NOTE: This is a salt-free broth. Add salt to taste, as desired. *If your slow cooker is smaller, you can half the recipe using 1 chicken carcass and half of the remaining ingredients. Once the bones are cooked place bones in a large stockpot and cover with water. Add the vinegar and allow to sit at room temperature for about 30 minutes. As the weather changes and remains cold, there is a demand on your immune system. If you are healthy and not faced with a lot of additional stressors, often you can weather the change and remain healthy. This holds true for some who seem to never get the flu. But if you get the flu once or twice a year or get sick and remain sick for 5 days to a week or longer, then you likely need to make some changes and take some steps to improve your immune system. For many, the cold weather coupled with consistent stress of everyday life can push an already weakened immune system to the edge, leading to common illnesses and viruses. If you have low immune system reserves, you may have increased risk of illness during the cold weather. Start now! It’s now time to get started on strengthening your immune system and reducing your risk of the initial colds, flu’s and secondary infections from a run-down immune system. Remember the best defense against flu is prevention. I recommend that along with healthy habits and following the guidelines above, that you take a natural immune support supplement to ward off flu throughout the flu season (October-March). It is an investment in your health, prevents unwanted time off from work and helps you to remain healthy. Thanksgiving is November 23rd. This year, try a farm-fresh and local Turkey. Below are a few places to consider. Don’t delay, they’ll go quick. Time to order your turkey! They’ll offer broad breasted, white turkeys. The turkeys are fed an organic, soy-free diet. The turkeys are processed on the farm, the Monday prior to Thanksgiving so they’ll be fresh-—not frozen. They’ll take orders until sold out. This year, they’ll offer Turkeys from Polyface Farm. They are broad breasted, white turkeys that are raised on pasture and fed GMO free grains. They’ll take orders until sold out. Heritage Turkeys. They’ll take orders until sold out. These are just a few of the many hardworking, friendly, and knowledgeable farmers we have in our area. If you get the chance, come out to the local markets and meet them! Bethlehem Farm, which means “house of bread” in Hebrew, started their venture with a brick oven. They started farming to provide their family with a healthier and safer source of food, and an excellent training experience for their home schooled children. They felt God calling them to this mission. Over the years they have grown into a prosperous family farm. They now offer pasture raised, organic, soy free, poultry eggs and meat (turkey and chicken). They also offers grass fed and finished beef, pastured pork, organic fresh milled breads and brick oven pizza, granola, cookies, chicken stock and more. They continually work to diversify and offer more products for themselves as well as the community. Along with the Old Town Farmer’s Market, they also sell direct from the farm and currently sell their eggs in a store in Martinsburg, WV. Boward Family Farm is family owned and operated. What started out as a way to provide their family with safe and healthy food, turned into so much more. Their sustainable, non-GMO, chemical free farm is located in Hampshire County, West Virginia. To keep their farm chemical free, they use practices such as companion planting, lime, diatomaceous earth, and homemade fertilizer. They are learning as they go, keeping an organic integrity at all costs. At the farmers market this year, they are offering produce such as carrots, beets, rhubarb, dried cayenne peppers, horseradish root, purslane, lambs quarters, and more. They also offer free range, organically fed chicken eggs. These eggs are the real deal, they have a dark yoke and are very tasty! They also offer natural home health and beauty products like green salve and bug spray. In the future, they plan to provide meat from their heritage breed Large Black hogs. Hedgebrook Farm in Winchester, VA seems to be doing it all. The owner, Kitty Hockman is always looking for new ways to help the community with her land and farm. The farm has been in operation since 1906. Kitty came back to the farm in the 70’s to help her parents. She ended up changing it from large scale production to a smaller herd of Jersey cows. The smaller scale allows her to sell her products directly to her customers, which she loves. The farm provides raw milk and cheeses from their Jersey cows, grass-fed, hormone-free meats (beef, lamb, and pork), and raw honey. All of these products are available at the farm. They are certified organic and Animal Welfare Approved. They use their own compost, aged at least 1 year, and focus on companion planting, and organic sprays to reduce pests. The farm is also home to donkeys, llamas, ducks, chickens, turkeys, cats, peacocks, and more. They provide cow boarding, educational tours, a wonderful vacation retreat called the Herds Inn, and soon to open The Birds Nest, their first tiny house. The farm is also home to the Opequon Presbyterian Church community garden (who donates all of their produce to Highland Food Pantry) and TEENS, Inc. mentioned below. To further help the community, Kitty volunteers as a chair of the Winchester, Frederick County Tourism Board, where she works to bring groups of people to the community. She is also an elected official to the Lord Fairfax Conservation Board, where she helps land owners find more sustainable uses for the water, land, and air. TEENS, Inc. is an amazing addition to our community. They provide at-risk youth agricultural knowledge and skills to help prepare them for a brighter future. They are a certified organic, non-profit organization located at Hedgebrook Farm, where they grow produce with aquaponics, soil, and tower gardens in a 3000 sq. ft. greenhouse. They offer produce such as herbs, kale, lettuce, tomatoes, collard greens, cucumbers, and melons. Their produce is sold at the Old Town Market as well as Gentle Harvest in Marshall, VA.
Mayfair Farm in Bunker Hill, WV, is an example of what hard work and determination means and a true gem in my eyes. They have been selling, rain or shine, at the Freight Station Farmer’s Market since 1987. They are dependable, kind-hearted, and sell the widest selection of local fruits, berries, and vegetables in the area. They started their farm in 1983 at square one and it has been their sole source of income since 1987. The farm is 50 acres in size, with about 6 acres of orchard, 3 acres of all berry varieties, 5 greenhouses, and 12 acres of vegetables. Along with tons of tree fruits, berries, and over 35 different vegetables, they also offer cut flowers, herbs, jams/jellies, baked goods, and wild caught Alaskan fish (caught by a family member in Alaska). They use organic practices, such as composting, mulching, cover cropping, organic fertilizers, and disease barriers. They spray the fruit trees on a very limited basis with organic and chemical sprays. Along with the market, they also sell to One Block West, Violino Ristoranti Italiano, The Farmers Daughter in Capon Bridge, WV, and contribute to 2 local food pantries. Visit them at the Freight Station during the hours listed above all year long! Mock’s Greenhouse and Farm in Berkeley Springs, WV, provides excellent hydroponic produce. They are one of only a few Good Agriculture Practices certified hydroponic growers on the east coast. The owner, Paul has been farming his whole life and continues to perfect his growing techniques to provide high quality produce. They offer 6 varieties of tomatoes, 6 varieties of cherry tomatoes, 6 varieties of lettuce, along with cucumbers, cilantro, basil, and watercress. They do not use any herbicides, pesticides or chemicals. Instead, they use tools like natural predators (lady bugs), Jalapeno juice, and organic fertilizer. To help increase their lettuce production to keep up with demand, last year they expanded their growing area by 16,000 square feet! Later this season they will offer triple sweet corn, peppers, berries, and ginger. During the winter they also sell Christmas trees. 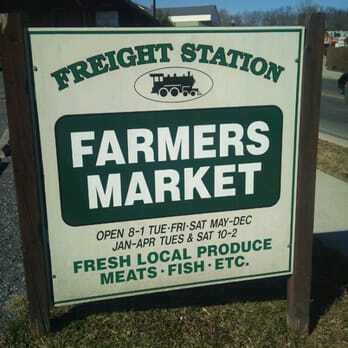 Along with the Old Town Farmer’s Market they sell at 11 other markets around the area, Whole Foods and Wegmans in the DC area, and local restaurants in Berkeley Springs. The good eating season has arrived! Summer fruits like blueberries, watermelon, cantaloupe and peaches are now in peak season. Delicious summer vegetables like tomatoes, corn, eggplant and squash are here and in abundance. Fresh and local fruits and vegetables are tastier and last longer. Support your local farmers and those markets that support local suppliers. Over the years I’ve created some regular go-to recipes to use during this bountiful summer season. This zucchini and cherry tomato crustless quiche couldn’t be easier to whip up for a quick and delicious weeknight meal. Crockpot pulled pork and this spicy peach salsa works great together for taco night. I like to make my own corn tortilla but sometimes pick those up at the market if I don’t have the time to spare. If you need a tasty and convenient picnic salad, I’d recommend trying this farro vegetable salad. The white balsamic vinegar provides a nice balance of sweetness to go along with the punchy and spicy jalapeno pepper. This cucumber and mint agua fresca is a light and fun way to stay hydrated in the summer heat. And along with that summer time heat – popsicles are a must. Homemade popsicles are so easy and when you make them yourself, you know exactly what you and your family are eating. Try my recipe for these summer melon pops. I’m always on the lookout for new and interesting ways to serve summers bounty at my kitchen table. What are some of your go-to summer recipes? Lyme Disease is a multi-system disease which can affect virtually every tissue and every organ of the human body. It is a disease which can be mild to some, and devastating to others. It can cripple and disable, or fog your mind. It can affect men, women, and children, and even your family dog. You may test negative for the disease, and still have it, or test positive and be symptom free. Some will get symptoms within days of a tick bite, while others may have it for years before they are even diagnosed. Some Lyme patients are told they have fibromyalgia, chronic fatigue syndrome, MS, or some other disease of unknown origin. There are some studies which strongly support that the infection can be transmitted from mother to the unborn fetus, and may even cause still birth and has been implicated in some SIDs deaths. Read More "Lyme disease almost twice as common as breast cancer and 6 times more common than HIV/AIDS"
According to the EWG, sunscreen should be your last resort. Instead check the UV index, wear clothes, find shade and plan your activities around the sun. Finally read these facts about sunscreen and the sun. Read More "Everything You Need to Know about Sun Protection"